Essential plot rundown: Peter Parker gets bit by a spider and gets super powers and his parents did some stuff. Before I start, I just want to say that "my" Spider-Man was the Spider-Man of 90s' cartoon; I have never read a comic. And obviously I've seen the three Raimi/Maguire movies. (But it's been a long time since I've seen any of those). So, I'm not expert on Spider-Man canon. Let's start with the villain: The Lizard. He was actually pretty cool. I was a little worried when I first saw the concept art for him. I was use to him having a snout (is that what they are called on lizards?) and not a round head. But I thought the design worked pretty well. By removing the snout, it made him a little less monster and a little more human, making it easier to sympathize with him. Though, I didn't believe his transformation from mild-mannered scientist to crazy villain; that wasn't developed as much as it should. But, one thing that did bother me was when he talked. It never looked like his mouth matched what he was saying, like the sync was off. But maybe it was because he didn't have any lips. I was also a little unclear on why he would transform back to human. It seemed like the compound would only last so long after injecting himself. But there was one scene where he makes a comment about reptiles being threatened and it shows a scaly patch on his neck, making it seem that his transformation is similar to the Hulk's. (But I think the reason is the former). He also starts talking to himself, which reminded me of the Green Goblin from the Raimi movie. If there was an explanation for that, I missed it. But, overall, I liked him as a villain. When I think of Spider-Man, I think of Mary Jane (love interest) and Jonah Jameson (trying to catch Spider-Man). But, here, they are replaced with Gwen Stacy (love interest) and her dad Captain Stacy (trying to catch Spider-Man). So, it was a little weird to see that replacement. It was also weird to see Martin Sheen and Sally Field as his uncle and aunt. It is always weird for me to see famous people I'm familiar with portraying already existing characters I'm familiar with. 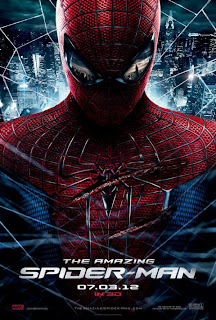 This is my first Andrew Garfield movie, so I didn't have a problem there. But, whenever I saw Martin Sheen on screen, I saw Martin Sheen, not Uncle Ben. However, they both did a really good job, it just took me a while to get use to them. Another thing that was weird was the non-existant use of "With great power comes great responsibility". That is an iconic line that is 100% associated with Spider-Man. While Uncle Ben teaches the concept, he never words it like that. Not having that line is like not having Spider-Man be a nerd. I wonder what the reason was for leaving it out. But, going back to Uncle Ben and Aunt may, there were some pretty dramatic scenes with them. The scene where Uncle Ben gets shot is emotional. You can really feel Peter Parker's pain. There were also some strong scenes when Peter Parker would come home, all beat up after chasing crooks, and had to confront Aunt May. You could totally tell that she was extremely worried and wanted to help. It was hard on her. I was not expecting those powerful scenes. 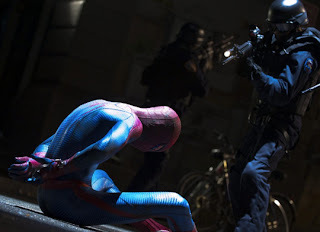 In this movie, Spider-Man does not wrestle. But I did like how they kept the wrestling aspect in and tied it to him becoming Spider-Man. I also thought they did a good job of showing his transformation to Spider-Man. He is a high school kid who is angry at losing his uncle. And he acts like that. While I did not believe Conners' change, I did buy Spider-Man's. I think I'll end with a couple of more things that bothered me. The music: it was too obvious. If something dramatic was happening, the music was super dramatic. If something scary was happening, the music was too scary. It called attention to itself in ways that music shouldn't. Spidey strength: he underestimates it too often. I understand that he is a lot stronger now and has to get use to it but there are too many times that he breaks this or hurts that. It was funny the first time or two, but then it just got repetitive. The lost shot of movie: too cheesy, especially in 3D. But overall it was a really good movie. 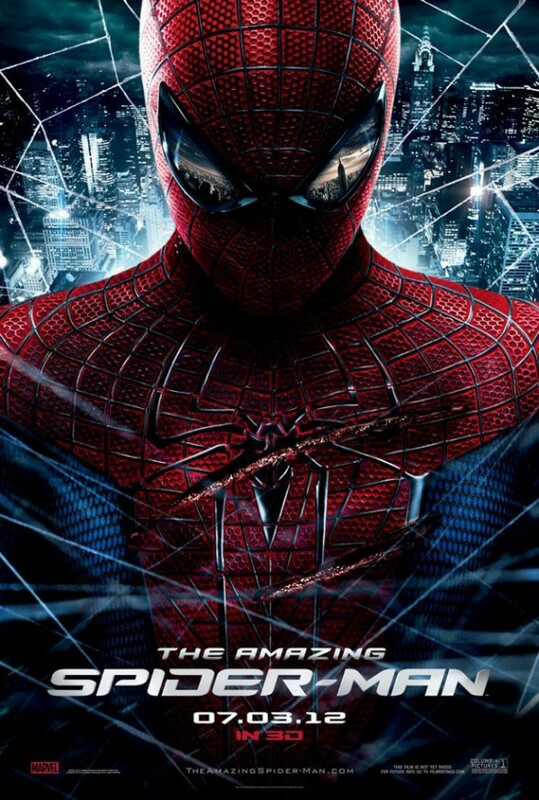 While Raimi's Spider-Man was kind of bubbly and childish, The Amazing Spider-Man is more mature and dramatic. It is definitely worth watching.